Thoroughly enjoyed The Phantom of the Opera! The production, costumes, music, performances were excellent! I specially loved James Barbour as the Phantom and Ali Ewoldt as Christine. Barbour's voice pierced through my soul. He became the Phantom. Ali has so much energy and beautiful voice as Christine. My favorites by far! I loved everything, the music, the voices, the stunning dresses, the stage! It's a MUST see if you are a Broadway beginner (like me). I took my 13 year old niece with me and we were crying. It was the best choice. I really liked the music, it was altogether very enjoyable! One of my favorite musicals ever! When you hear every word clearly and beautifully sung...and you're in the balcony...you know it's Broadway. Norm Lewis sings "The Music of the Night" with breath-taking sensitivity and depth. Mary Michael Patterson (the "alternate" Christine) was charming with a gorgeous voice and Jeremy Hays was the perfect Perfect Man Who Can Also Sing. Every role was done well and the actors seemed to truly enjoy the performance. The strings and organ music fill the house; the scenery is stunning; the theatre is beautiful. This show delights your eyes and your ears. An evening of musical magic. I saw phatom in augudt 2013. It was awesome! The music was greatand the scenes were great! I took my 12 yr old daughter with me and she loved it too? It was an amazing show and I want to go again!!! The world's most magical musical, I cried 5 times. This musical is obviously excellent, it's the longest running show on broadway for a reason. Stunning sets, beautiful music, and SIERRA BOGGESS AND HUGH PANARO ARE PERFECT. It has been a few years since I have seen The Phantom of the Opera, and particularly longer since seeting it on Broadway. The first thing I noticed was the type of audience was not the sort of person that you often see at a Broadway show, the audience were full of tourists, who were ticking off the "see a Broadway show" on the must-do list, and bought tickets to the only show that they had heard of. This is the beauty of The Phantom, it attracts so many people who are not regular theatre goers and gives them that experience, and a desire to come back for more. 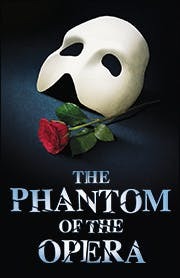 Hugh Panaro does not have the classic deep Phantom voice, his voice puts a different angle to the character of the Phantom, and slightly more like The Phantom is in Love Never Dies. The Phantom of the Opera is a classic for everybody of all ages. Even for me, someone who despises classical opera, I really loved this from the moment I saw the show; it was life-changing. During the Overture, the hairs on the back of my neck stood up. I was freaked out when the chandelier crashed, and I cried in the final scene. This was the first time I saw it. The second time I saw it, the Overture was even more electrifying, I was more frightened during the Act 1 Finale, and I bawled like a baby in the last scene. The Phantom of the Opera is a tale of seduction, romance, revenge and unrequited love. The acting was phenomenal. If you're a parent, don't fear, you can take the whole family with you. There is really no profanity, although some sensual movement. The operatic arias may bore them a little, but the title song's 80's drum-beat will surely give them a retro thrill. It also gives your a good opportunity to talk with your kids about judging by looks and accepting people for who they are. Isn't this enough for you? The Phantom of the Opera is a spectacular classic that never gets old. Go out and get tickets already! Have seen this production 6 times over the run of the show and I'm still left breathless and exhausted by the sheer emotional impact of the Phantom of the Opera. There is not one thing to complain about in this timeless classic. All aspects of the Broadway musical are showcased at the Majestic Theatre on a daily basis with this bittersweet beautiful love story. The entire cast is stellar and the orchestra transports you effortlessly to the Paris Opera House where you sit in box 5 (sic) and soak in the majesty of this stunning musical. Again, the Orchestra just blew everyone away with their performance,so much that a crowd of at least 100 or more people surrounded the pit as the audience exited the theatre, and saluted the orchestra with thunderous applause following the final strains of their performance. OUTSTANDING !!! I will make sure I see this at least one more time before its historical Broadway run comes to an end. And no, I'm not a 12 year old teen age girl or an investor or even a minor relative of anyone related to the show. I'm a 58 year old married man who just happens to immensely enjoy the Broadway musical in all its forms and conceptions who just happens to think Phantom is by far one of the best musicals ever.